Ta da…my blog can now be found at sequinsandsushi.com! No more long link to find it 🙂 I finally bought the domain so now it will be much easier to share the link and also no one else can take the name, yay! However, all of the old links to sequinsandsushi.wordpress.com will still be directed here, which makes it so easy. I’m so excited! Thanks to Jess, I have also now become a Blue Diamond Tastemaker, which means I can sign up for projects involving certain products of theirs (almonds, almond milk, crackers, etc.) and write a blog post about them. In exchange for the blog post, they send me the products free; I can choose to put them in any recipe I would like! Currently all of the projects are full but I am hoping to do a sponsored post soon. Check out Jess’s post using Blue Diamond vanilla almonds to make banana nut bread muffins! I also started a new workout regimen this week (titled Time for a Change…how fitting!) that I had pinned on Pinterest awhile back. Let me just say, I am hobbling around like an old person right now. It hurts just to sit on the toilet, but no pain no gain, right?? On Wednesday I did “Monday” and yesterday I did “Tuesday”, and since I work at the bar tonight this will have to be one of the “take it easy” days…but I usually do a lot of running around at work, so I won’t necessarily be taking it easy! 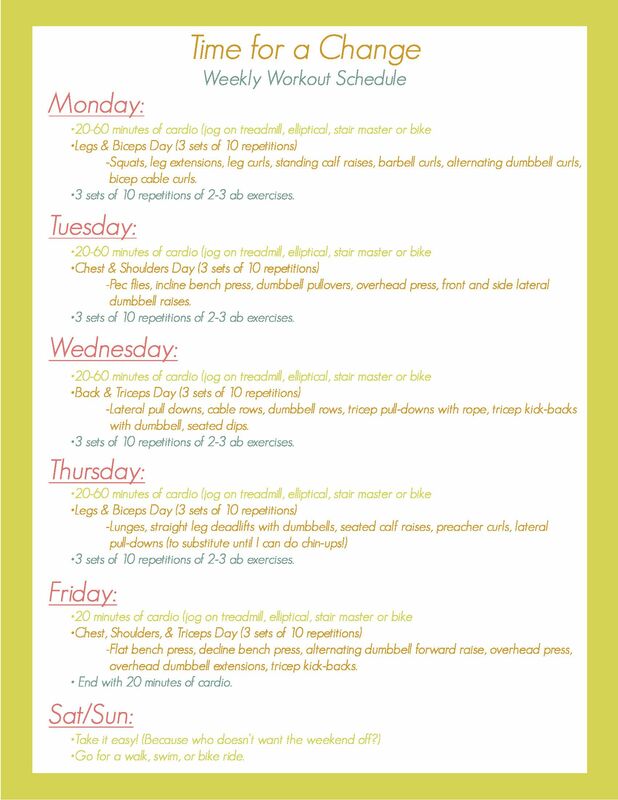 I like that it can be customized to each person’s weekly routine, and it also allows you to choose your own ab exercises and cardio, so you can try to improve each week. I like having a structured “plan”, otherwise I end up just doing a bunch of random things at the gym. The soreness makes me believe it’s working so far! I also found a few good articles on the My Fitness Pal blog: this one about how to eat well while on vacation (probably should have read that before my trip…) as well as this one about the importance of having a treat day/meal/snack every once in awhile. If you deprive yourself of something, you will eventually snap and binge on it. I think of the times when I “cheat” and order a meal/dessert that is fried/unhealthy; usually after having just a few bites I realize I don’t want it anymore, but by telling myself I couldn’t have it, I just made myself crave it even more and I’ll eat the whole thing. Thinking ahead and planning for these treats can allow you to enjoy something you love without going overboard. Also, by not letting yourself have treats as often, they become something you look forward to!